SHE by SO.CAP.USA, the world’s leading provider of all-natural hair extensions, will be hosting its 7th Annual Pink Hair For Hope™ campaign. During the months of September and October, clients who donate $10 or more to Pink Hair For Hope™ in participating salons, will receive a 100% natural, pink SHE by SO.CAP.USA hair extension. All net proceeds will go directly to The American Cancer Society™, a nationwide, community-based voluntary health organization dedicated to eliminating cancer as a major health problem. Participating clients can choose from professionally bonded pink hair extensions, which are attached to their natural hair, or clip-in hair extensions that they can put in themselves and re-wear over and over again. SHE by SO.CAP.USA offers these extensions in various shades of pink, including fuschia, bright pink, and light pink as well as popular feather and crystal extensions. As breast cancer is the most common cancer among women in the United States, SHE by SO.CAP.USA also provides alternatives for women who have been touched by the ill-effects of this disease. For those who have completed chemotherapy and have new hair growth to 1½ to 2 inches, SHE by SO.CAP.USA provides its awarded winning, all-natural hair extensions. With SHE by SO.CAP.USA's lower temperature bonding methods for hair extensions, the product can be attached to thin or new growth hair for a strong and long-lasting hold, enabling women to have a full head of 100% human within 2 to 4 months after chemotherapy is completed. In addition, SHE by SO.CAP.USA also offers hair replacement alternatives for those with hair loss due to chemotherapy. 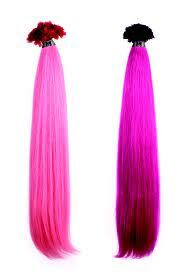 The company features an extensive line of superior quality wigs available in synthetic and 100% human hair. To find a participating Pink Hair For Hope™ salon near you, a free hair extension consultation or for more information about SHE by SO.CAP.USA Hair Extensions, call 877-855-4247 or visit: www.PinkHairForHope.org or www.socapusa.com. SHE by SO.CAP.USA Hair Extensions offers the largest selection of hair types and hair color for hairstylists to select from: more than 90 hair color shades are currently available in three different textures: straight, medium wave and curly. All SHE by SO.CAP.USA Hair Extensions and equipment are developed and manufactured at the Company’s factory in Italy, by its team of specialized research chemists, engineers and hair extensionists. They use only the best hand selected, 100% European-type human hair that is pre-bonded with 100% Keratin Tips to ensure a healthy, strong and long-lasting bond. All SHE by SO.CAP.USA Hair Extensions are applied with the latest equipment, utilizing the lowest temperature on the market (110°C). The Company recently introduced several new and innovative products, including new clip-in hair pieces, special adhesive extensions called Extensives, long hair wefts, hair parfum and three new flat irons, as well as a new warm fusion machine – FireX. SHE by SO.CAP.USA Hair Extensions also offers a complete line of wild hair color options and hair ornamentation, such as strands of crystals and feathers. www.socapusa.com. To date the Pink Hair For Hope™ campaign has brought together more than 500 salons and raised over 2.3 million dollars for research to fight Breast Cancer. Individuals can go to participating local salons and have a lock of SHE by SO.CAP.USA's signature pink hair extension added to their own locks for a $10 donation. SHE by SO.CAP.USA also has Hair Replacement Options to provide patients with an alternative to wigs in order to replace hair loss due to chemotherapy. www.pinkhairforhope.org.